At Gra-Mac Distributing, we’ve been offering quality irrigation solutions to the areas of North Carolina for years. Whether you’re in Lexington, Winston-Salem, Statesville, Salisbury, Mocksville, or the other surrounding areas, we have irrigation products and equipment that can help you out. Unfortunately, the need for quality irrigation products is somewhat diminished if you fall into believing some of the commonly perpetuated myths and misconceptions regarding the subject. Irrigation can be a complex, highly meticulous process, and mistakes can cost you. The last thing you want is to lose large areas of your garden or farm to ill-informed gardening practices, which is why we’re here to dispel some of these myths. We’ve made it our life’s work to supply farmers and gardeners with exceptional irrigation equipment, so you can bet that we know a thing or two about irrigation. Here are some of the most common myths and misconceptions about irrigation systems. One common recommendation that’s passed around through word of mouth is the “one inch a week” rule. This is a general guideline that dictates your plants should get about one inch of water every week. This, naturally, leads people to tune their watering systems to provide just that. It’s not false that many plants require this amount of water, but in reality, the watering needs for different plants are so different and diverse that you’re not doing any of them any favors by establishing a uniform watering amount across the board. The easiest way to spell this out is to compare it to other life — do you need the same amount of food as your cat every day? Should an infant drink the same amount of water as a grown adult? Should the zoo give meerkats and elephants receive equal portions because they’re both living organisms in the animal kingdom? Of course not — these assumptions sound ridiculous, and when you look at the diverse watering needs of plants, giving them all the same amount is folly in equal measure. The watering needs of specific plants is a deep rabbit hole that extends beyond the scope of this blog post, but a good place to start would be searching online for the plants that you’re cultivating to get an idea of what you should be giving them every week. Somehow, despite how patently false this myth is, it continues to be propagated. This myth is an example of a half-truth — watering your plants overhead under bright sunlight is, in fact, not recommended, but not for the reasons you’d think. The perception is that the water droplets on plants act as tiny magnifying glasses that enhance the sun exposure, causing burn to the leaves. Unfortunately, there is no scientific evidence to support this claim. A common rebuttal to this is that human skin burns faster when it’s wet. This, too, is only half true. It is true that most people burn quicker and more intensely when they’re in and around water, but it’s not because of a magnifying effect — it’s because UV rays reflect off bodies of water, causing you to take sunlight from both above and below. There’s also the psychological effect of feeling wet and cool, thus causing a lot of people to neglect sunscreen. However, water droplets functioning as micro-magnifying glasses has nothing to do with it. That being said, the best times to water your plants, according to most professionals, is right before or after sunrise. Watering under the hot sun is not recommended; not because of burn damage, but because the water evaporates at a much faster rate, potentially robbing your plants of the hydration they deserve. Have you seen a crop of plants start to wither away, even if you’ve felt like you’ve been watering them enough? Hold your horses — before you run back to your controls and order a torrential downpour on your garden, consider that there might be other reasons your plants are wilting. Wilting isn’t explicitly a sign of thirst; it could be overzealous digging that has disrupted the soil and roots or pests in the soil that are messing with the plant’s growth. In fact, you can have a dying plant that has a perfectly healthy amount of water in the soil. Before you pump your irrigation to 11, check the soil around your wilting plants. Make sure that it’s sufficiently damp, and that there aren’t any conditions that could stifle root growth. If the soil seems to be properly hydrated, avoid feeding more water into it because you could end up drowning your roots and worsening the problem. What could help is providing more surface water. Instead of sending it straight into the soil, provide your plants with some much-needed overhead hydration. This is another example of looking at the situation too simplistically. If you look at water as being water no matter what and making a vague assumption that water = growth, then this logic may hold up. However, in a real gardening or farming environment, you can’t just break things down that generally. Rainfall is consistently inconsistent, and just because it showers a little bit doesn’t mean that you shouldn’t run your irrigation system. A lot of rainwater is usually lost to runoff and evaporation, and every storm is different. If you turn off your irrigation systems during rain, you might be saving water for some plants, but others might still not be getting enough. Are you looking for a compromise? Rain sensors are a great way to manage your irrigation systems automatically, while still accounting for the moisture that rain provides. A rain sensor can detect the amount of rain that has come down, and determine whether it’s expedient to run the irrigation system. If you’re looking for a rain sensor to make things easier, consider purchasing one from our online store that’s filled with quality irrigation products! Here is another half-truth. In a normal context, it is true that watering your plants via soil is ideal. Less water is lost, as it goes straight to the roots. However, there will always be situations where it’s expedient for your plants to get some overhead water. Plants rely on their leaves and foliage to absorb sunlight. If these leaves are compromised, it impairs the plant’s ability to properly photosynthesize. Insects can cause damage to your plants, but routine overhead watering can help them to not get too established. Windy weather can also cause dust to accumulate on your plants, reducing their ability to properly absorb sunlight. Overhead watering also provides needed moisture to plants that are being baked by heat, in a way that direct water to the roots doesn’t. At Gra-Mac Irrigation, we have a great selection of overhead irrigation supplies. Consider checking them out if you’re in need of a new overhead watering mechanism! 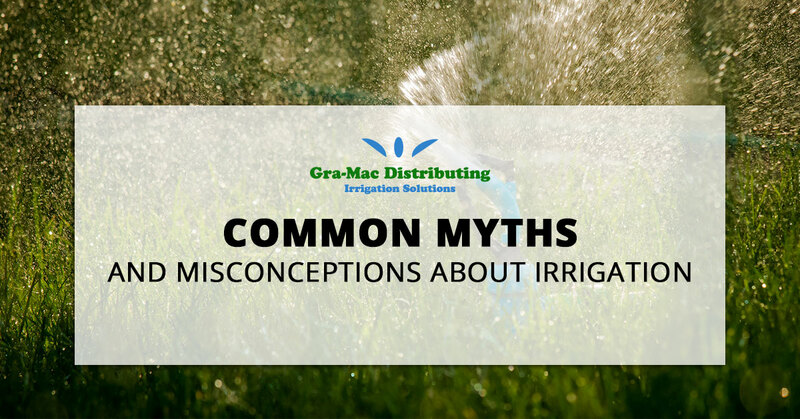 It’s important to not be fooled by the common myths that are propagated about irrigation. If you do, you might be spending more money than you need to, only to care for your plants in a way that could end up killing them. Gardening and farming is already a fairly arduous process, so there’s no need to complicate it further by messing up with your irrigation. At Gra-Mac Irrigation, we provide an incredible supply of quality irrigation equipment. Now that you’re a little more up to speed with what’s what in irrigation, consider browsing our online store, and feel free to contact us today.